Kung Fu Panda 2 in Blu Ray in Dolby Surround Sound! James Hong has news !! Po is my fav character. Giving them the new DVD. The Tigress is my favorite. Kung Fu Panda 2 release in Blu-Ray! My favorite is the Dragon Warrior of course! I love Tigress because of the way she’s grown during the movies. The Dvd is the gift and Po is my favorite!!!! Kung Fu Panda Give away. The children will receive a copy of Kung Fu Panda 2, on Blue Ray. I like Mr Ping. ... is a copy of the new bluray movie!! Mantis is our family favorite! Kung Fu Panda 2 DVD in Blu-Ray is the surprise. Mr. Hong tells them he has a free copy of the movie Kung Fu Panda 2. The surprise is Kung Fu Panda 2 on Blu-Ray + DVD. The surprise - Kung Fu Panda 2 DVD on Blu-Ray! Po is our favorite character. 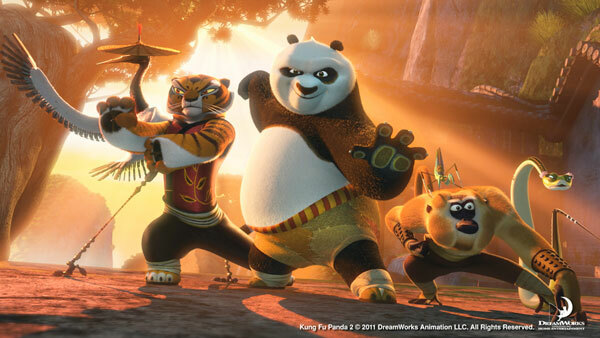 Kung Fu Panda 2, yeah! His surprise is Kung Fu Panda 2 on Blu-ray featuring Dolby. My favorite character is Po, he’s endearing. Kung Fu Panda 2 on Blue Ray! The surprise for the children is Kung Fu Panda 2 in blue ray dvd. He has a Kung Fu Panda 2 Blu-ray for them. My favorite character is Po. Thanks for the chance. The Kung Fu Panda 2 on Blu-Ray, and my favorite is Po!